Diarmuid Murtagh of DCU goes for goal during their Sigerson Cup quarter-final loss against UCD. Image Credit: Mark Carroll. DCU crashed out of the Sigerson Cup at the hands of bitter rivals UCD on February 7th, after a poor start saw Niall Moyna’s men seven points behind after just twenty minutes in St Clare’s. UCD raced to a seven point lead before DCU could register a score, but despite a strong DCU fightback in the middle quarters, UCD kept the hosts at arms length to cruise into a Sigerson Cup semi-final. “Obviously we left ourselves with a lot to do, probably too much to do but we came out strong in the second half and we still could have won the game,” DCU’s Diarmuid O’Connor said after the defeat. The opening stages were dominated by UCD as Kerry’s Jack Barry, Conor McCarthy and Evan O’Carroll terrorised the DCU defence. DCU’s opening score came after the 20th minute courtesy of captain Stephen O’Brien. 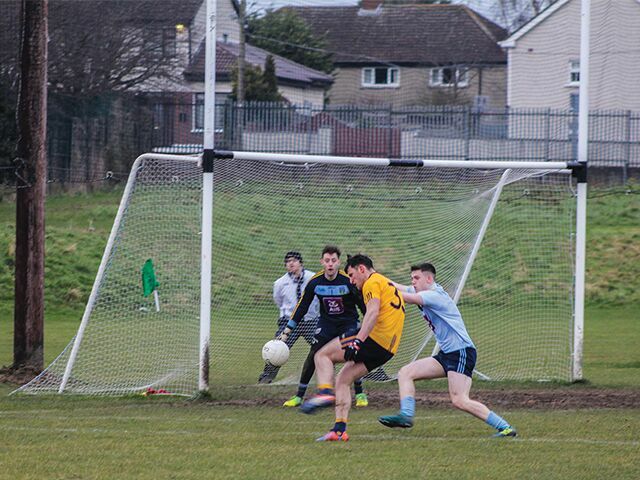 DCU fought back and was back in the game thanks to the excellent awareness of Diarmuid O’Connor who took a quick free. He drilled a pinpoint diagonal ball over UCD full back Cillian O’Shea and into the hands of Diarmuid Murtagh who rifled it home to make it a one point game. However, DCU weathered the storm in the second half, as points from Paddy Durcan and Eanna Ó Conchúir were eclipsed by that of O’Carroll’s accurate free takes which made UCD look like the more assured side. DCU’s cause was not helped by the dismissal of Ciaran Boylan on the 53rd minute as UCD marched to a four point victory. “I suppose the first half was very disappointing,” O’Connor said, as “the first 25 minutes we were very slow to get going. I think we found ourselves seven or eight points to no score, but we dug deep in the end of the first half and we got right back into the game.